ULTIMATE MATHS TUITION BY SINGAPORE MATHS TUTORS! 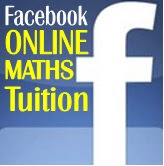 : Online Maths Tuition from Anywhere at Anytime! Online Maths Tuition from Anywhere at Anytime! MATHS SPECIALIST - Mr K L Chua, and his trainers! Labels: Online Maths Tuition from Anywhere at Anytime! Home tuition in Singapore provides tutors with teaching experience and a good track record- perhaps you should check them out!